Eeek! 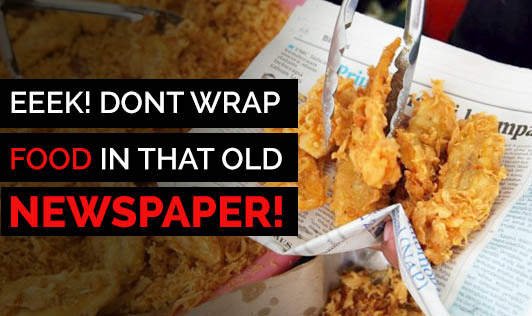 Dont Wrap Food In That Old Newspaper! It is a very common sight in our country to see so many small food outlets wrapping food in old newspapers. We have no complaints about it until someone in the family falls sick and we blame it on "unhygienic food" or niftily call it "food poisoning". We fail to understand that even though the street vendor might have prepared the food hygienically, his food wrapping may make the food hazardous. Or, even to simply remove excess oil, we ourselves start looking for yesterday's paper to squeeze it out! It is understood that eating outside has always been risky due to poorly maintained hygiene and improper handling of foods. But, it is this newspaper covering on foods that make them worse. This is true especially with finger foods like mirchis, bajis, vadas, chaats etc. Studies have shown that the newspaper ink which is carcinogenic (cancer-causing) can get leached into the food that it is in contact with. Many newspapers use low quality ink that is highly toxic. It is also known that old newspapers are excellent breeding grounds for various bacteria and viruses. If the ink in the newspapers is fresh, it can irritate your stomach and can also cause respiratory problems. Our health council of India is educating vendors to substitute newspapers with tissue papers or butter papers that are safer than newspapers. After understanding these facts, make sure you don't wrap foods in newspapers or buy foods wrapped in them. If you can, educate the shop keeper about it and spread the word!